Having already discussed the many reasons to cook your own dried beans (they’re tasty, healthy, and inexpensive) and how easy it is, I won’t go into that again here. What I will say is this: although you can further embellish these beans or use them in other recipes, these basic white beans are so good that I also like to just serve them with a spoon. They are gently aromatic, tender, wholesome, and delicious. You can cook any white beans following this recipe. Cannellini beans, flageolets, Great Northerns, navy beans, even chickpeas. Larger beans will take longer to cook, that’s all. 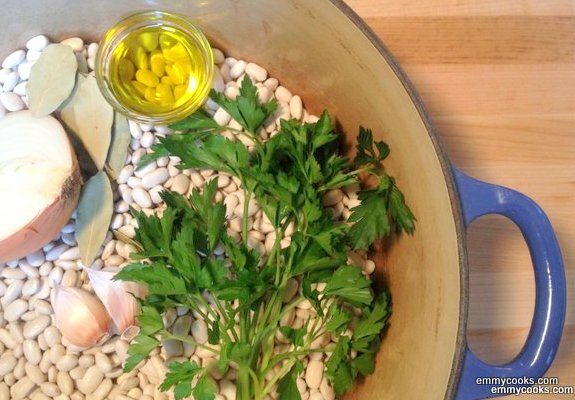 How to Cook White Beans: Soak beans overnight covered in several inches of water, or quick-soak them (bring beans and 3-4 times their volume of water to a boil for a full minute, then cover and remove from heat for at least an hour). Or you can skip the soaking stage altogether (it will just take longer for your beans to cook). Drain the beans if you soaked them. In a heavy pot, cover beans with a few inches of fresh water, and bring to a boil. Reduce the heat to a simmer and add aromatics: onions, garlic, herbs. I follow Deborah Madison’s advice from Vegetarian Cooking for Everyone, of course: per cup of white beans, add 1 small quartered onion, 2 bay leaves, several sprigs of parsley, a big sliced clove of garlic, a tsp. of olive oil. You could use any or all of these, plus infinite variations depending on the fresh and dried herbs you have at your fingertips. Simmer, partially or fully covered, until the beans begin to soften (probably 30-60 minutes if you have soaked them), then add 1 1/2 tsp. salt per cup of beans that you started with. Continue cooking until fully tender and let cool in the bean broth. Remove onion, bay leaves and parsley stems before serving. If you drain the beans to use in a recipe, please promise me that you’ll use the bean cooking liquid to replace part of the broth in the next bean soup or minestrone you make. It’s too tasty to throw away, and full of beany nutrients. Thank you for visiting Emmy Cooks! You can see more of my favorite recipes by clicking the “My Favorite Recipes” category on the sidebar (here are June, July, and August). If you like what you see here, you can sign up on the sidebar to receive our daily recipe by email, or you can follow Emmy Cooks on Facebook, Twitter, or Pinterest. This entry was posted in Beans and Other Legumes, DIY and tagged beans, children, cooking, DIY, family, food, homemade, kids, lifestyle, recipes, vegan, vegetarian on March 22, 2012 by emmycooks. That sounds absolutely delicious. I love the idea of baking little tomatoes into the beans! I have made a similar dish with greens instead of tomatoes and I do love the crunchy/creamy contrast. Thank you for the delicious suggestion! Awesome! I do try to cook my own beans whenever possible – it is so healthy and much more economical! Love the way you think Emmy! This is a great post! Just yesterday in class, another student made hummus out of white beans and it was fantastic. I’m going to start using them more, and thank you for all the tips… and for scolding those who’d think about throwing out the cooking liquid! That made me laugh :) You’re completely right! Mmm, white bean puree. Thinned as a side, thick as a hummus, yum. It’s so true! Bean cooking liquid is liquid gold. Great tip to keep it. You can use it for so much stuff! Thicken soups, stews, thin purées. Everything! It’s true. They are a pretty amazing meal by themselves, and they dress up so nicely! And alongside one of those quinoa salads of yours…yum. I know that it’s getting warmer, but you gave me cassoulet ideas. There’s nothing like slowly cooked beans – with the convenience of canned you often forget how much better they are when you soak and cook them yourself. But I do soak them longer — at least 24 hours with 3 water changes — according to WAPF/NT practice — they do have a lot of phytic acid, and that is best neutralised by longer soaking so that we get to absorb all of those minerals. The best food in the world is dried beans cooked properly with correct ingredients. served with stewed tomatoes make a perfect meal. You lost me at the part where I was supposed to remove the parsley, onions, etc. it’s much harder to do than it sounded! Just brought them down from the boil and it already smells wonderful. Making some cornbread on the Green Egg.